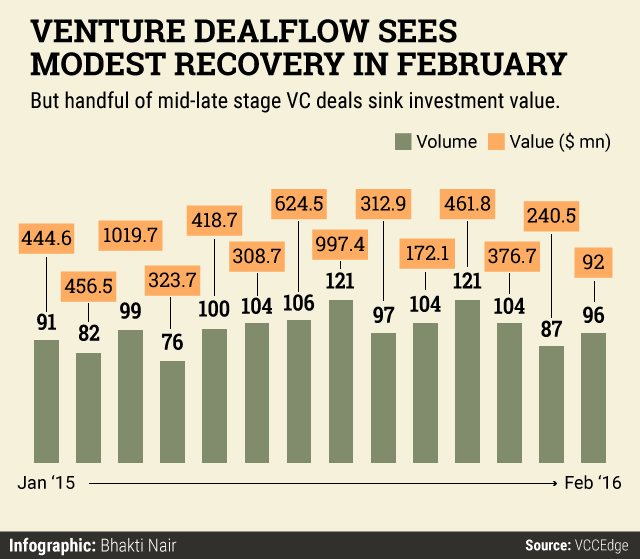 Is venture funding in India's super-hot startup ecosystem sliding? Yes and no. After hitting a peak last year when a startup received funding every seven hours from an angel investor or venture capital firm, the new year started on a poor note (click here for more on how 2016 kicked off). However, data compiled by VCCEdge, the financial research platform of VCCircle, show there are two shades to the emerging trend. Indeed, VC firms active in the mid-to-late stage venture funding cycle have tightened their purse strings. This has also impacted the overall flow of VC money to Indian startups as the quantum of investments in these deals is of much higher ticket value. However, the silver lining is that the overall deal flow has strengthened, albeit marginally, in the country last month. Click here for a more detailed look on how different stages of venture funding performed last month. A VCCircle survey of private equity and venture capital investors too signals that seed-stage funding is the new sweet spot for VC firms this year (click here for more on that).